December 2: The news in the blog post I’m going to drop tomorrow. Yes, I’m being cryptic. Yes, I want you to stay tuned. This is good for everyone. December 3: Theatre Out and David Carnavale. I was reminded yesterday that Theatre Out produced my very first out-of-town play, a ten-minute called “Write This Way.” I remember how excited I was to get that email, validation that something I was doing was right. It even won the Producers’ Award, and I haven’t looked back since. December 4: Patient people of all kinds: it has been a rough couple weeks. December 5: Sitting in a theater in my hometown and not recognizing a single person in a sold out house. Theater is not dead! December 6: Every theater company who has this year switched to electronic submissions. Thank you! December 7: Press tickets. Just being honest. December 8: When old shows seem new. I expected tonight’s ANNIE to be same old, same old, but new staging, choreography, song segments, and humor made it feel fresh. December 9: A 3:26 direct flight to Fort Lauderdale tomorrow. There’s no way I’m going to oversleep for that one! December 10: A perfect, on-time flight that allowed me to get to Fort Lauderdale in plenty of time to see Michael McKeever’s DANIEL’S HUSBAND–and the playwright! Enthusiastic audience members charged the playwright after the show. December 11: Ann Filmer, the perfect roommate; she sleeps through anything just like I do! 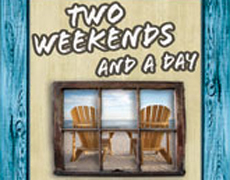 December 12: The opportunity to see the wonderful TWO WEEKENDS AND A DAY, by another playwright friend, Susi Westfall. How often do the stars align that we can catch each other’s work like this? December 13: The entire National New Play Network Showcase event (and NNPN itself! )—seeing readings of six new plays, meeting a ton of great theater folks, sharing insights, being in Miami, experiencing the graciousness of our host (New Theatre) and its staff… I could go on and on. Thank you to Nan Barnett and the NNPN staff for a wonderful weekend; I can’t wait for the next one! December 14: William Missouri Downs, the generous friend and playwright who drove me (and two others) to the airport this morning at 5:15 a.m. on his way to the Fort Lauderdale airport—just because he’s that kind of guy. And Andrew from Atlanta, who appeared after my flight karma ran out. I made it from Miami to LaGuardia, but fog had grounded everything and, after much delay, my flight to Buffalo was canceled. Andrew from Atlanta was behind me in line, said he was renting a car, and offered me a lift. I got home at 9:30 instead of who-knows-when thanks to this impulsive and generous stranger. December 15: All the travel that playwriting has afforded me this year. I’ve been to New York (three times), Miami (twice), La Jolla, Richmond, Denver, Phoenix, and Chicago. If can consider those trips (and all the great people I met as a result of them) part of my year’s income, I didn’t do too badly!